Just like other forms of conscious sedation, IV sedation dentistry is designed to relax and make you comfortable. 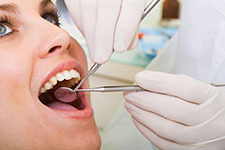 It can be used with routine cleanings up to lengthy cosmetic dental procedures or oral surgery. The effect of IV sedation can be felt quickly and the dentist will be able to adjust the sedative medication as needed throughout the dental procedure. IV sedation dentistry uses a mild form of sedation that induces a state of deep relaxation and a feeling of peace. Some people will refer to this as “sleep dentistry” or “twilight sleep”. This is actually a form of conscious sedation. During the dental procedure, you will be able to understand and respond to requests from your dentist. The drugs used for IV sedation dentistry produce either partial or full memory loss of the dental procedure. This means time will seem to pass very quickly and you will not recall much of what happened. For many people, they will remember nothing at all. If you have a bad gag reflex or are uncomfortable sitting in a dental chair for extended periods, IV sedation can help you. You will be unaware of the sights, sounds or smells of the dental office. When the procedure is over, you will have little or no memory of the procedure. IV sedation gives your dentist a high level of control of the dosage which will control your consciousness level. Through your appointment we will closely monitor your vitals to ensure your safety. Provides safe, effective pain and anxiety control. Faster onset means you’ll be able to feel the effects of the medication quickly. More control. Your dentist readily increase or decrease the level of sedation as needed. Little or no recall of any dental procedures. Able to accomplish more high-quality dentistry in less time. Each patient will respond a little differently to IV sedation which means each patient’s recovery time is different. Many patients will feel more alert soon after the IV medication is stopped. You will need to arrange for a responsible adult to drive you home after your appointment. Patients are instructed not to drive a car or operate heavy machinery for at least 24 hours. Nausea is a possible side effect but there are medications available to control this. If you’re ready to discover truly relaxing IV sedation dentistry, general dentistry, and other cosmetic dentistry services, contact Dr. Kidess today at (480) 991-2290 to schedule an appointment.